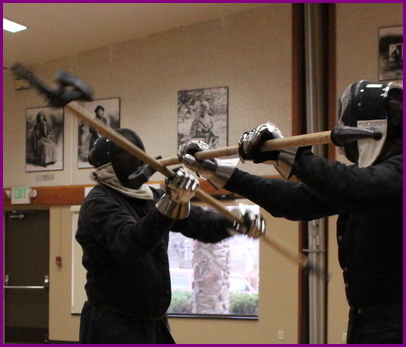 Join Veritas Swordplay Academy for a hands-on exploration of genuine Historical European Martial Arts (HEMA) using a variety of armed and unarmed methods. Build athletic ability and develop life skills while exploring this fascinating historical martial art! The longsword is our core teaching weapon, with additional training provided in pole axe, dagger, hand-to-hand, messer (short sword), sword & buckler, spear and other forms of traditional medieval weapons. Practice arms and fencing masks provided. Gloves are required. See Equipment for more details! Monthly classes resume in November! For mobile devices, please click here to register! No part of this site nor it's content may be reproduced without permission from Veritas Swordplay Academy. Historical combat arts are not to be undertaken without proper professional instruction. Do not try this at home. Copyright 2005-2016 by Veritas Swordplay Academy. Website design by Lindy Fullmer Designs 2010.